Knotts Farmhouse015394 32321work01539 433251fax Self-cateringThere can be few properties in the whole of the Lake District which offer such stunning views as Knotts Farmhouse. It sits in an elevated hillside position overlooking the lower Troutbeck Valley taking in the whole vista of Lake Windermere with the western fells of Coniston Old Man and the Langdale Pikes in the distance. Whatever the weather this view will enchant you with its different moods and dramatic sunsets. The 17th century listed farmhouse is part of Knotts Farm and there are walks from the door up the Troutbeck Valley and into the hills. The road to Kirkstone Pass and over to Ullswater passes the gate and the property will make a fine spot from which to tour the whole of the Lake District or you may simply wish to relax on warmer days and enjoy the beautiful location. Accommodation: Front door into character sitting room - beamed ceiling, spice cupboard dated 1688, gas fired log burner, (TV, VCR, DVD player, mini hi-fi, radio and free Wi-Fi). Door through to the spacious farmhouse dining/kitchen which has a large table for family meals - a very sociable room and sure to be the focal point of any holiday. Inglenook fireplace with gas fired log burner. Good utility room with door to garden. Stairs from the dining kitchen give access to three bedrooms - two doubles, one of which has a king-sized bed, and a single - and a bathroom (bath, basin and wc). Further stairs from the sitting room lead to the two other bedrooms - one twin and one single - and a separate wc with washbasin and a separate shower. The farmhouse has a wealth of character features with many beams and interesting windows. There are views from all the west-facing windows. Fitted carpets. Furnishings are comfortable in traditional style with lots of personal touches to complete the home from home feel. Some double glazing. Outside: Sheltered west-facing patio with fine views leading to a large enclosed garden with lawn and shrubs and garden furniture. Ample parking for three cars in named spaces within the farm grounds. Pub restaurant and shop in Troutbeck Bridge approx. 1 mile down the hill. Sorry no pets * non-smoking * duvets/beds made up for arrival * ceramic hob/electric oven * dishwasher * fridge * freezer * auto washer/dryer * microwave * payphone * gas central heating and hot water * free Wi-Fi * all fuel included * travel cot and high chair available - please order * towels available - please order * supermarket 1 mile approx. Knotts Farmhouse offers weekly bookings starting on Saturday. Knotts Farmhous offers weekly bookings starting on Saturday. 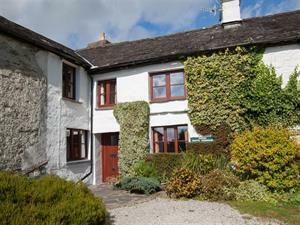 There can be few properties in the whole of the Lake District which offer such stunning views as Knotts Farmhouse. It sits in an elevated hillside position overlooking the lower Troutbeck Valley taking in the whole vista of Lake Windermere with the western fells of Coniston Old Man and the Langdale Pikes in the distance. Whatever the weather this view will enchant you with its different moods and dramatic sunsets. Younger children will need to be supervised on the roadside. Children welcome from any age.